Car rental in Latvia. Rent a car in Riga and Jurmala. Car rent in Latvia with Prime Car Rent company means a convenient pick up and drop off place of the rental car, a quick documentation process and good prices. Our experienced staff is always ready to help. 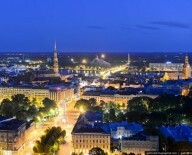 We provide a car rental service in Latvia in Riga and Jurmala. It's also possible to rent a car in any other city of Latvia. To get an offer for a car hire in any other city in Latvia you could call us (+371) 2844 1166 or send your request to our e-mail: reservations@primecarrent.com. If you have ordered a rental car in the last minute (less than 24 hours before the pick up time) in Latvia, we advise You to contact the operator by the number: (+371) 2844 1166 (an operating time: 24/7/365). Renting a car in Latvia you are allowed to use the car in other countries of Baltic states (Estonia and Lithuania), in other countries of European Union and also to go to Russia and Belarus (but crossing the border should be arrange in advance so we could prepare all necessary documents, insurances and permissions). In order to rent a car in our company in Latvia it's enough to have a driver's licence of European Union.If you have a driver's licence of non European Union country we recommend to have an international driver's licence too. This is the rule of using the car in EU and if the police will stop you you will definitely face troubles. Rental car could be returned in any day at any time without additional fee (24/7/265).